Homer Page, American (1918-1985). 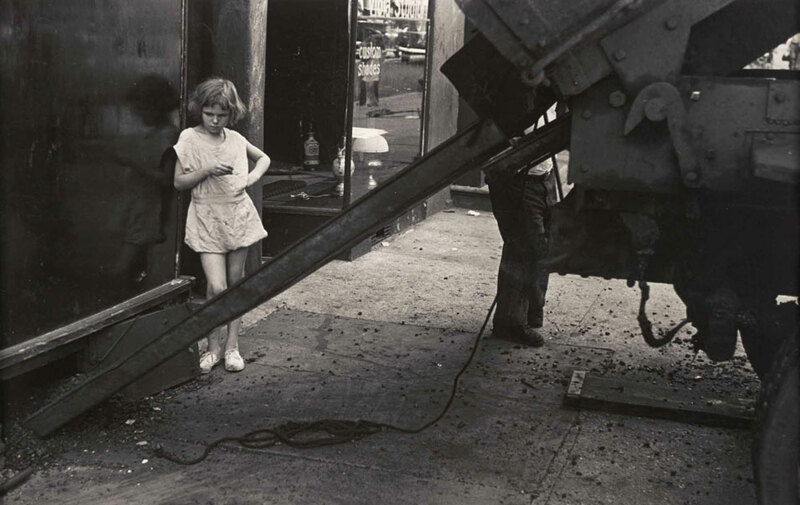 New York, August 11, 1949 (girl and coal chute) Gelatin silver print. Image: 8 3/8 x 12 7/8 inches (21.27 x 32.7 cm). Gift of Hallmark Cards, Inc., 2005.27.4345. KANSAS CITY, MO.- Homer Page, a brilliant but nearly forgotten photographic talent, will be reintroduced to the public when The Photographs of Homer Page: The Guggenheim Year, New York, 1949-50 opens Feb. 14 at The Nelson-Atkins Museum of Art. The exhibition of rare vintage black-and-white prints, on view through June 7, will focus on the innovative work he produced in New York in 1949 and 1950, funded by a prestigious Guggenheim Fellowship. These works are drawn from a total of about 100 prints by Page in the Museums Hallmark Photographic Collection, acquired by the Nelson-Atkins in 2006. Because Page exhibited and sold very few of his works during his lifetime, he is underappreciated and largely unknown today. This exhibition marks an important first: this group of prints has never been publicly displayed. Keith F. Davis, Curator of Photography at the Nelson-Atkins, first encountered Pages work while researching and writing the first edition of An American Century of Photography, published in 1995. Davis, then Hallmark Fine Art Programs Director, recalls:. I came across a quote from Page that I found extremely interesting and insightful. Pages comments from a 1950 symposium at the Museum of Modern Art titled What is Modern Photography? revealed a deep understanding of the currents of documentary or what we might now call street photography of the day. The quote prompted Davis to search for Pages photographs, leading to an exciting discovery of a lost photographic treasure. He was soon in touch with the Page estate and ended up purchasing about 100 prints for the Hallmark collection, including many that were one of a kind. Page captured both the facts and the feeling of life in post-war New York: commuters in transit to and from their offices, the signs of commercial and consumer culture, leisure pursuits and night life, psychological vignettes of the lonely and dispossessed. His work provides a rich and original vision of 1949 America. Page was devoted to the visible facts of his world, but his real goal was something much deeper: the emotional tenor of life at that time and that place. This is a body of work of great passion, intelligence, and artistic integrity -- one that is all the more important for having remained essentially unknown to the present day, Davis said. Stedelijk Museum voor Actuele Kunst Presents Mark Manders - "The Absence of Mark Manders"